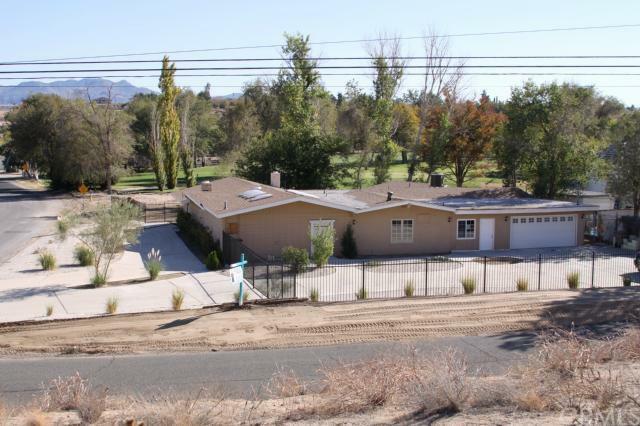 Completely remodeled in 2013 this 3,851 square foot house features 5 bedrooms, with 3 baths. All new roofing, copper plumbing, electrical wiring, dual pane windows, interior doors and attic insulation. Master bedroom with full bath and walk-in closet. Second master bedroom with shower and outside entrance. Very large living room with fireplace, beamed ceilings and a golf course view. Second large room with separate entrance that can be used as an office, bedroom or play room. Separate indoor laundry room. Very large spa room with vaulted ceilings, raised in floor spa, waterfall, seating area and french doors leading to the master suite. Large kitchen with walk-in pantry, island, granite counters, stainless steel sink, dishwasher, cherry wood cabinets, recessed lighting and french doors leading to the backyard patio facing the golf course. Two new all electric central heat and air conditioners. One is a 5 ton and the other is a 2 ton unit. Located on the 10th hole of the Hesperia municipal golf course which is formerly a PGA course. Circular drive way, wrought iron fenced, easy access to shopping, schools and parks. Priced at $319,000 which is $82.83 a sq ft. The average price per square foot in the area is about $115.00 and up!